Synopsis- In the tiny South African town of Jacob’s Rest, detective Emmanuel Cooper is sent to investigate the murder of an Afrikaner police officer, Captain Willem Pretorius. Cooper, an ‘English’ South African, is viewed with suspicion by both the Boer Afrikaners and the dead man’s prominent family. But as Cooper pursues his own inquiry, he discovers that Pretorius had led a deadly double life. The more he digs, the more dangerous the investigation becomes. For Cooper is a man with his own secrets, and learning the truth about Pretorius just might save his life – if he isn’t killed first. A thrilling, action-packed story combined with a thoughtful, complex portrayal of an unforgettable time and place and the human desires that drive us all, regardless of race, colour or creed. Review- I read this book in late October, after it’d been sitting on my To-Be-Read Shelf for quite some time. I picked it up at a second hand book shop after reading several promising reviews about Malla Nunn’s Detective Emmanuel Cooper series. 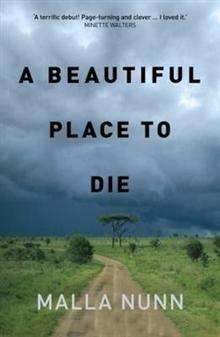 A Beautiful Place to Die is set in Jacob’s Rest, a South African town and is the first book featuring Detective Emmanuel Cooper who is known as an English or White South African. He is sent to Jacob’s Rest to investigate the murder of Captain Willem Pretorius, an Afrikaner police officer. The locals don’t take his presence their lightly and his authority in the town becomes more precarious when a special security team arrive and take the lead on the case- a lead Cooper feels is a dead end, so he continues his own inquiries in the face of danger. I was immediately hooked in this story. The South African setting is a character in its own right. There’s beauty and a harshness that Cooper experiences in this country and filters through to the reader. Cooper is a complex character who is brash, insightful and a little tortured. He’s deeply flawed, which makes him a very likeable and intriguing hero. In fact I liked how all the characters came to life, from the shy brown mouse (a young woman), the German doctor and the dead Captain. Even those who weren’t very likeable were still wholesome characters who were believable and interesting. I can’t mention too much about the plot without giving it away, but Nunn had me swept up in the story and guessing who dunnit until the very end. I’ll definitely read more in this series, and highly recommend this Australian-based author. It’s a great series Lauren, I recommend the rest!